Aon produces research reports, whitepapers, newsletters, and other thought leadership content addressing the most pressing Risk and People issues businesses face globally, covering topic areas including: risk, talent, health, retirement, data and analytics, and capital. 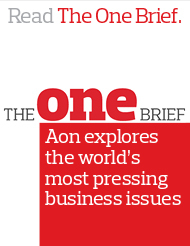 Click the titles and images below to access Aon's Thought Leadership. Data-driven study on emerging issues and managing risks.